No, this is not what was in the kitchen trash on either of the last two Wednesday nights. The nights Suki raided the garbage while I was in the local movie theater watching the Metropolitan Opera HD-filmed performances of Aida and Les Troyens. 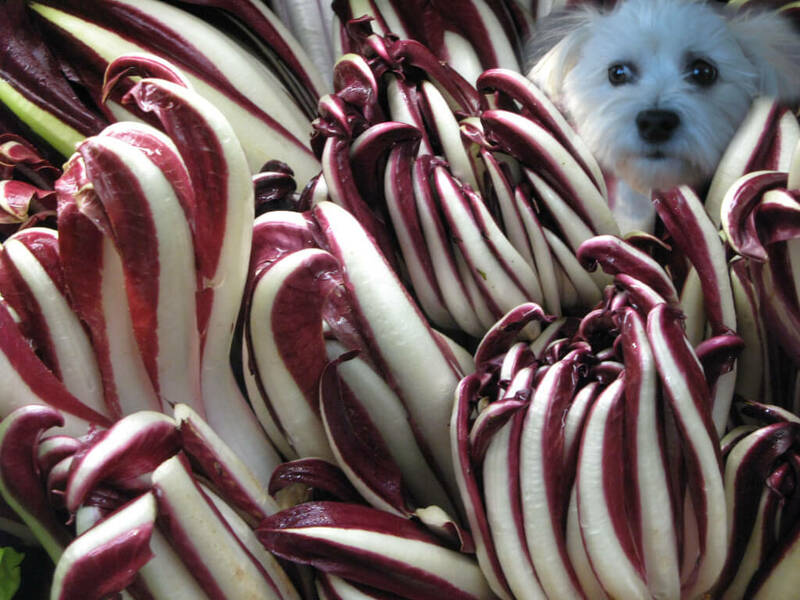 But the radicchio up close has a similar oozy-gooziness that reminds me of what lay all over the floor when I returned home hoping to collapse into bed after an exhausting five hour immersion into warring Greeks, storm-tossed Trojans and twirling Carthaginians. It bothers me that I did not reach for the camera to capture the stunning mess or the expression of shame on Suki’s face. What kind of photographer misses an opportunity like that? Instead, I went Photo-shopping three days later when I’d calmed down and Suki no longer smelled of onion and spoiled meat. You’re questioning why I don’t put baby-lock devices on the trash cabinet but I’m wondering why I don’t automatically reach for the camera when something exceptional lies in front of me. And why I feel compelled to Photo-shop everything. Why do I always have to change things? I can’t seem to shoot something and print it out straight, regular, as in reality. What is this all about? Still part of the grievSuki, a Havanese with a hardy appetite peering out from bunches of radicchioing process? Another example: I told my friend who I visited in New York City last week that I’d send her the photos I took of her cats. 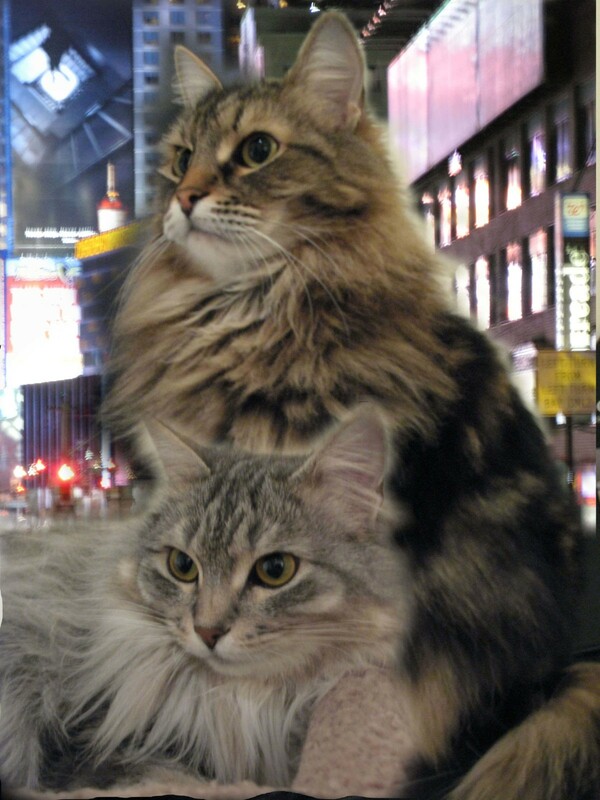 Beautiful soft sweet cats that have been transplanted to NYC along with my friend for six months. They watched me as I slept in the small living room on an inflated aero bed wedged between their beds and food dishes. They didn’t budge until I got up and opened the refrigerator to get myself a glass of water. One of them escaped from the apartment twice during my visit. Maybe he thought he could find his way back home to Ithaca. Or to the vast lawns at Central Park. I couldn’t capture that in the photo. I couldn’t just send the photo of the cats perched on the bathroom sink. No, I had to put them in Times Square at night. When I write, I work hard to find the exact words to describe reality, the truth. The way something looks, feels, sounds or tastes. I could never write fiction. It just isn’t in me. But when I Photo-shop, I can make up anything. I can tell a different story. Either way, telling the truth in words or stretching it in photos, I feel like I’m doing something good for myself. I’m inching out beyond my grief. This entry was posted in 2013 on 2013/01/28 by Robin Botie.